Ahh, the fascinating world of internet slang! Both impressive in its scope and absurd by its nature, this satirical style of commentary captures my attention completely. I relish oddities and foibles more than I can say. There is a great line in Jane Austen’s book Pride and Prejudice regarding Lizzy Bennett: “”[She had] a lively, playful disposition, which delighted in anything ridiculous…” That line is me. Not only do I love to read internet slang, but I thoroughly enjoy learning to use my favorite phrases correctly. Typically, my method begins when I see a phrase that seems concise enough to suit the grammar Nazi on one shoulder and snide enough to satisfy the sarcasm genie on the other. For instance, “seems legit” was a perfect phrase for me. I found it deliciously snarky and yet short and sweet. For such a little phrase it packed a punch, and I knew as soon as I saw it posted as a comment under a glorious, badly photoshopped photograph that this was my new idiom. Here is the thing, though: once I find a phrase I wanted to express properly, I cannot just slap it onto just any status update or picture. It is imperative that I use the expression correctly. Sarcasm can very easily be misunderstood or (far worse) sound awkward. Usage must be perfectly timed and correctly implemented. The hunt was on! I kept my eyes peel for woebegone status updates by teenage females believing they will never find true love, an image of the President holding an upside-down telephone, or Pamela Anderson’s bosom. My first attempt with the phrase was on a silly meme of a Scottish bagpiper. While technically the phrase would apply, I could feel the wrongness as soon as I pressed the submit button. Sure enough, the deafening silence of the internets confirmed my suspicion that my usage had been awkward and I slunk away from my laptop, shame-faced. No one would even have known this was photoshopped if it weren’t for the slight variation in pixel sizes. Finally, my chance arrived. 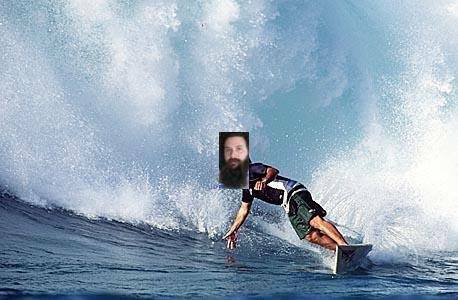 An Instagram friend posted a scanned photo of himself cut out and copied onto a postcard style photo of a surfer riding a monstrous, perfectly shaped wave. Success!! My comment was the very first response and was liked a whopping twenty seven times! Pleased with myself, I closed my laptop, folded my hands behind my head, and leaned back with a sigh of happiness. Victory was mine.